سلیمانی, علی, حسینی, سید سعید. (1396). مروری بر روند توسعه و بهبود عملکرد غشاهای پلیمری به منظور جداسازی و استحصال هلیم. 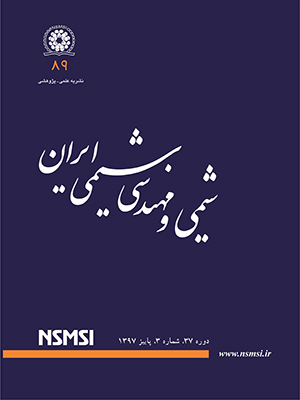 نشریه شیمی و مهندسی شیمی ایران, 36(1), 1-32. علی سلیمانی; سید سعید حسینی. "مروری بر روند توسعه و بهبود عملکرد غشاهای پلیمری به منظور جداسازی و استحصال هلیم". نشریه شیمی و مهندسی شیمی ایران, 36, 1, 1396, 1-32. سلیمانی, علی, حسینی, سید سعید. (1396). 'مروری بر روند توسعه و بهبود عملکرد غشاهای پلیمری به منظور جداسازی و استحصال هلیم', نشریه شیمی و مهندسی شیمی ایران, 36(1), pp. 1-32. سلیمانی, علی, حسینی, سید سعید. مروری بر روند توسعه و بهبود عملکرد غشاهای پلیمری به منظور جداسازی و استحصال هلیم. نشریه شیمی و مهندسی شیمی ایران, 1396; 36(1): 1-32. هلیم به دلیل ویژگی­های یگانه کاربردهای گسترده‌ای به­ ویژه در حوزه­ های پزشکی، هسته ­ای و فضایی یافته است. در حال حاضر منبع اصلی و صنعتی هلیم، گاز طبیعی است که باید حداقل دارای 05/0% مولی هلیم باشد تا فرایند استخراج که به­ طور عمده مبتنی بر سرمایش است صرف ه­ی اقتصادی داشته باشد. به دلیل برتری­ های بسیار فناوری غشایی، استخراج هلیم توسط این فناوری حدود نیم قرن است که مورد مطالعه قرار گرفته است. برخی غشاهای غیرآلی مانند سیلیکا عملکرد مناسبی در جداسازی هلیم از خود نشان داده‌اند اما هزینه‌ و پیچیدگی ­های ساخت و توسعه آن‌ها زیاد است. در مقابل غشاهای پلیمری کم‌هزینه‌ترند و نیاز به ارتقا و بهبود دارند تا عملکردشان به حد دلخواه برسد. درکنار ایجاد آمیزه پلیمری و به­کارگیری ترکیب­ های پرکننده غیر آلی، از جمله مؤثرترین روش‌های بهبود عملکرد این غشاها، سنتز غشاهای کوپلیمر می‌باشد. همچنین سامانه‌ی پیشنهادی استفاده‌ی ترکیبی از فناوری‌های سرمایشی، غشایی و جذب فشار نوسانی می تواند منجر به کاهش مصرف انرژی و هزینه‌ها ‌شود. Daly J.W., Helium Recovery from LNG, "International Petroleum Technology Conference", Doha, Qatar (2005). Rufford T.E., Chan K.I., Huang S.H., May E.F., A Review of Conventional and Emerging Process Technologies for the Recovery of Helium from Natural Gas, Adsorption Science & Technology, 32(1): 49-72 (2014). Welch R.V., Helium-What About It?, The Journal of Canadian Petroleum, 24(05) (1985). Kim D., "Helium Extraction from LNG End Flash, Master thesis, Department of Energy and Process Engineering", Norwegian University of Science and Technology (2014). Heidari M., Tavasoli A., Karimi A., Multi-Objective Iptimization of a Combined Cryogenic and Membrane Process for Helium Recovery from Natural Gas Using Genetic Algorithm, Petroleum & Coal, 57(6): 587-600 (2015). بنده علی، سمانه، تأثیر نانو ذرات سیلیکا بر کارایی غشای پلیمری آلیاژی ABS/PVAc برای جداسازی هلیم از متان، نشریه علوم و مهندسی جداسازی، (2)6: 1 تا 10 (1393). Jue M.L., Lively R.P., Targeted Gas Separations Through Polymer Membrane Functionalization, Reactive and Functional Polymers, 86(0): 88-110 (2015). Sanders D.F., Smith Z.P., Guo R., Robeson L.M., McGrath J.E., Paul D.R., Freeman B.D., Energy-Efficient Polymeric Gas Separation Membranes for a Sustainable Future: A Review, Polymer, 54(18): 4729-4761 (2013). Scholes C.A., Ghosh U., Helium Separation Through Polymeric Membranes: Selectivity Targets, Journal of Membrane Science, 520(0): 221-230 (2016). Stern S.A., Sinclair T.F., Gareis P.J., Vahldieck N.P., Mohr P.H., Helium Recovery by Permeation, Industrial & Engineering Chemistry, 57(2): 49-60 (1965). Nakoryakov V., Vitovsky O., Seryapin A., Helium Production Technology Based on Natural Gas Combustion and Beneficial use of Thermal Energy, Thermal Science, 20(suppl. 1): 19-22 (2016). Kohl A.L., Nielsen R.B., "Gas Purification, Chapter 15 - Membrane Permeation Processes", Gulf Professional Publishing, Houston (1997). Scholes C.A., Stevens G.W., Kentish S.E., Membrane Gas Separation Applications in Natural Gas Processing, Fuel, 96(0): 15-28 (2012). Li F., Qu Y., Zhao M., Efficient Helium Separation of Graphitic Carbon Nitride Membrane, Carbon, 95(0): 51-57 (2015). Mannan H.A., Mukhtar H., Murugesan T., Nasir R., Mohshim D.F., Mushtaq A., Recent Applications of Polymer Blends in Gas Separation Membranes, Chemical Engineering & Technology, 36(11): 1838-1846 (2013). Liu L., Wang D.K., Martens D.L., Smart S., da Costa J.C.D., Binary Gas Mixture and Hydrothermal Stability Investigation of Cobalt Silica Membranes, Journal of Membrane Science, 493(0): 470-477 (2015). Shelekhin A.B., Dixon A.G., Ma Y.H., Adsorption, Permeation, and Diffusion of Gases in Microporous Membranes. II. Permeation of Gases in Microporous Glass Membranes, Journal of Membrane Science, 75(3): 233-244 (1992). Gantzel P.K., Merten U., Gas Separations with High-Flux Cellulose Acetate Membranes, Industrial & Engineering ChemistryProcess Design and Development, 9(2): 331-332 (1970). Fischer S., Thümmler K., Volkert B., Hettrich K., Schmidt I., Fischer K., Properties and Applications of Cellulose Acetate, Macromolecular Symposia, 262(1): 89-96 (2008). Orme C.J., Klaehn J.R., Stewart F.F., Gas Permeability and Ideal Selectivity of Poly[bis-(phenoxy)phosphazene], Poly[bis-(4-tert-butylphenoxy)phosphazene], and Poly[bis-(3,5-di-tert-butylphenoxy) 1.2(chloro)0.8phosphazene], Journal of Membrane Science, 238(1–2): 47-55 (2004). Zadhoush A., Hosseini S.S., Mousavi S.M., The Importance and Influence of Rheological Characteristics of Polymer Solutions in Phase Inversion Process and Morphology of Polymeric Membranes, Iranian Journal of Polymer Science and Technology (PERSIAN), 28(5): 351-371 (2016). López-González M., Saiz E., Riande E., Guzmán J., Transport of Hhelium in Polycarbonate Membranes, Polymer, 43(2): 409-413 (2002). Kumazawa H., Sada E., Nakata K., Kawashima N., Kataoka S., Tada K, Enrichment of Helium by Asymmetric Hollow-Fiber Membrane of Cellulose Triacetate, Journal of Applied Polymer Science, 53(1): 113-119 (1994). Peterson E.S., Stone M.L., Helium Separation Properties of Phosphazene Polymer Membranes, Journal of Membrane Science, 86(1-2): 57-65 (1994). McCaffrey R.R., Cummings D.G., Gas Separation Properties of Phosphazene Polymer Membranes, Separation Science and Technology, 23(12-13): 1627-1643 (1988). Hellums M.W., Koros W.J., Husk G.R., Paul D.R., Fluorinated Polycarbonates for Gas Separation Applications, Journal of Membrane Science, 46(1): 93-112 (1989). Kim T.-H., Koros W.J., Husk G.R., Advanced Gas Separation Membrane Materials: Rigid Aromatic Polyimides, Separation Science and Technology, 23(12-13) 1611-1626 (1988). C. O'brien K., Koros W.J., Husk G.R., Polyimide Materials Based on Pyromellitic Dianhydride for the Separation of Carbon Dioxide and Methane Gas Mixtures, Journal of Membrane Science, 35(2): 217-230 (1988). Min K.E., Paul D.R, Effect of Tacticity on Permeation Properties of Poly(methyl methacrylate), Journal of Polymer Science Part B: Polymer Physics, 26(5): 1021-1033 (1988). Bikson B., Nelson J.K., Muruganandam N., Composite Cellulose Acetate/poly(methyl methacrylate) Blend Gas Separation Membranes, Journal of Membrane Science, 94(1): 313-328 (1994). Kharitonov A.P., Taege R., Ferrier G., Teplyakov V.V., Syrtsova D.A., Koops G.H., Direct fluorination—Useful Tool to Enhance Commercial Properties of Polymer Articles, Journal of Fluorine Chemistry, 126(2): 251-263 (2005). Kharitonov A.P., Kharitonova L.N., Surface Modification of Polymers by Direct Fluorination: A Convenient Approach to Improve Commercial Properties of Polymeric Articles, Pure and Applied Chemistry, 81(3): 451-471 (2009). Kiplinger C.L., Persico D.F., Lagow R.J., Paul D.R., Gas Transport in Partially Fluorinated Low-Density Polyethylene, Journal of Applied Polymer Science, 31(8): 2617-2626 (1986). Langsam M., Anand M., Karwacki E.J., Substituted Propyne Polymers, I. Chemical Surface Modification of Poly[1-(trimethylsily)propyne] for Gas Separation Membranes, Gas Separation & Purification, 2(4): 162-170 (1988). Xiao Y., Low B.T., Hosseini S.S., Chung T.S., Paul D.R., The Strategies of Molecular Architecture and Modification of Polyimide-Based Membranes for CO2 Removal from Natural Gas - A Review, Progress in Polymer Science, 34(6): 561-580 (2009). Tin P.S., Chung T.S., Liu Y., Wang R., Liu S.L., Pramoda K.P., Effects of Cross-Linking Modification on Gas Separation Performance of Matrimid Membranes, Journal of Membrane Science, 225(1-2):77-90 (2003). Liu Y., Wang R., Chung T.-S., Chemical Cross-Linking Modification of Polyimide Membranes for Gas Separation, Journal of Membrane Science, 189(2): 231-239 (2001). Shao L., Chung T.-S., Goh S.H., Pramoda K.P., Transport Properties of Cross-Linked Polyimide Membranes Induced by Different Generations of Diaminobutane (DAB) Dendrimers, Journal of Membrane Science, 238(1–2): 153-163 (2004). Fu S., Sanders E.S., Kulkarni S.S., Wenz G.B., Koros W.J., Temperature Dependence of Gas Transport and Sorption in Carbon Molecular Sieve Membranes Derived from Four 6FDA Based Polyimides: Entropic Selectivity Evaluation, Carbon, 95(0): 995-1006 (2015). Hosseini S.S., Omidkhah M.R., Zarringhalam Moghaddam A., Pirouzfar V., Krantz W.B.,Tan N.R., Enhancing the Properties and Gas Separation Performance of PBI–Polyimides Blend Carbon Molecular Sieve Membranes via Optimization of the Pyrolysis Process, Separation and Purification Technology, 122(0): 278-289 (2014). Campo M.C., Magalhães F.D., Mendes A., Carbon Molecular Sieve Membranes from Cellophane Paper, Journal of Membrane Science, 350(1–2): 180-188 (2010). Centeno T.A., Fuertes A.B., Carbon Molecular Sieve Gas Separation Membranes Based on Poly(vinylidene chloride-co-vinyl chloride), Carbon, 38(7): 1067-1073 (2000). Hosseini S.S., Chung T.S., Carbon Membranes from Blends of PBI and Polyimides for N2/CH4 and CO2/CH4 Separation and Hydrogen Purification, Journal of Membrane Science, 328(1–2): 174-185 (2009). Favvas E.P., Heliopoulos N.S., Papageorgiou S.K., Mitropoulos A.C., Kapantaidakis G.C., Kanellopoulos N.K., Helium and Hydrogen Selective Carbon Hollow Fiber Membranes: The Effect of Pyrolysis Isothermal Time, Separation and Purification Technology, 142(0): 176-181 (2015). Hosseini S.S., Teoh M.M., Chung T.S., Hydrogen Separation and Purification in Membranes of Miscible Polymer Blends with Interpenetration Networks, Polymer, 49(6): 1594-1603 (2008). Bushell A.F., Attfield M.P., Mason C.R., Budd P.M., Yampolskii Y., Starannikova L., Rebrov A., Bazzarelli F., Bernardo P., Carolus Jansen J., Lanč M., Friess K., Shantarovich V., Gustov V., Isaeva V., Gas Permeation Parameters of Mixed Matrix Membranes Based on the Polymer of Intrinsic Microporosity PIM-1 and the Zeolitic Imidazolate Framework ZIF-8, Journal of Membrane Science, 427(0): 48-62 (2013). Cong H., Radosz M., Towler B.F., Shen Y., Polymer–Inorganic Nanocomposite Membranes for Gas Separation, Separation and Purification Technology, 55(3): 281-291 (2007). Ahn J., Chung W.-J., Pinnau I., Song J., Du N., Robertson G.P., Guiver M.D., Gas Transport Behavior of Mixed-Matrix Membranes Composed of Silica Nanoparticles in a Polymer of Intrinsic Microporosity (PIM-1), Journal of Membrane Science, 346(2): 280-287 (2010). Fryčová M., Sysel P., Hrabánek P., Koèiøík M., Brabec L., Zikánová A., Bernauer B., Èapek P., Hejtmánek V., Helium Permeation through Mixed Matrix Membranes Based on Polyimides and Silicalite-1, Diffusion Fundamentals, 11(0): 1-2 (2009). Hosseini S.S., Li Y., Chung T.-S., Liu Y., Enhanced Gas Separation Performance of Nanocomposite Membranes Using MgO Nanoparticles, Journal of Membrane Science, 302(1-2): 207-217 (2007). Song Q., Nataraj S.K., Roussenova M.V., Tan J.C., Hughes D.J., Li W., Bourgoin P., Alam M.A., Cheetham A.K., Al-Muhtaseb S.A., Sivaniah E., Zeolitic Imidazolate Framework (ZIF-8) Based Polymer Nanocomposite Membranes for Gas Separation, Energy & Environmental Science, 5(8): 8359-8369 (2012). Ordoñez M.J.C., Balkus Jr K.J., Ferraris J.P., Musselman I.H., Molecular Dieving Realized with ZIF-8/Matrimid® Mixed-Matrix Membranes, Journal of Membrane Science, 361(1–2): 28-37 (2010). Feijani E.A., Mahdavi H., Tavasoli A., Poly (vinylidene fluoride) Based Mixed Matrix Membranes Comprising Metal Organic Frameworks for Gas Separation Applications, Chemical Engineering Research and Design, 96(0): 87-102 (2015). Hao L., Li P., Chung T.-S., PIM-1 as an Organic Filler to Enhance the Gas Separation Performance of Ultem Polyetherimide, Journal of Membrane Science, 453(0): 614-623 (2014). Preston W.E., Barlow J.W., Paul D.R., Effect of Crystallinity on Gas Permeation in Miscible Polycarbonate–Copolyester Blends, Journal of Applied Polymer Science, 29(3): 845-852 (1984). Kapantaidakis G.C., Kaldis S.P., Dabou X.S., Sakellaropoulos G.P., Gas Permeation through PSF-PI Miscible Blend Membranes, Journal of Membrane Science, 110(2): 239-247 (1996). Ohya H., Kudryavsev V., Semenova S.I., "Polyimide Membranes: Applications, Fabrications and Properties", Gordon and Breach, (1996). Pirouzfar V., Hosseini S.S., Omidkhah M.R., Moghaddam A.Z., Modeling and Optimization of Gas Transport Characteristics of Carbon Molecular Sieve Membranes through Statistical Analysis, Polymer Engineering & Science, 54(1): 147-157 (2014). Choi J.I., Jung C.H., Han S.H., Park H.B., Lee Y.M., Thermally Rearranged (TR) Poly(benzoxazole-co-pyrrolone) Membranes Tuned for High Gas Permeability and Selectivity, Journal of Membrane Science, 349(1–2): 358-368 (2010). Zimmerman C.M., Koros W.J., Polypyrrolones for Membrane Gas Separations. I. Structural Comparison of Gas Transport and Sorption Properties, Journal of Polymer Science Part B: Polymer Physics, 37(12): 1235-1249 (1999). Pinnau I., Toy L.G., Gas and Vapor Transport Properties of Amorphous Perfluorinated Copolymer Membranes Based on 2,2-bistrifluoromethyl-4,5-difluoro-1,3-Dioxole/tetrafluoroethylene, Journal of Membrane Science, 109(1): 125-133 (1996). Macchione M., Jansen J.C., De Luca G., Tocci E., Longeri M., Drioli E., Experimental Analysis and Simulation of the Gas Transport in Dense Hyflon® AD60X Membranes: Influence ofResidual Solvent, Polymer, 48(9): 2619-2635 (2007). Jansen J.C., Macchione M., Drioli E., On the Unusual Solvent Retention and the Effect on the Gas Transport in Perfluorinated Hyflon AD® Membranes, Journal of Membrane Science, 287(1): 132-137 (2007). Robeson L.M., The Upper Bound Revisited, Journal of Membrane Science, 320(1–2): 390-400 (2008). Pan C.Y., Gas Separation by Permeators with High-Flux Asymmetric Membranes, AIChE Journal, 29(4): 545-552 (1983). Giglia S., Bikson B., Perrin J.E., Donatelli A.A., Mathematical and Experimental Analysis of Gas Separation by Hollow Fiber Membranes, Industrial & Engineering Chemistry Research, 30(6): 1239-1248 (1991). Ahsan M., Hussain A., Mathematical Modeling of Helium Recovery from a Multicomponent Fuel Gas with Polymeric Membrane, International Journal of Chemical Engineering and Applications, 6(3): 173-178 (2015). Laguntsov N.I., Kurchatov I.M., Karaseva M.D., Solomakhin V.I., Churkin P.A., Influence of Membrane Selectivity on Helium Recovery from Natural Gas, Petroleum Chemistry, 56(4): 344-348 (2016). Laguntsov N.I., Kurchatov I.M., Karaseva M.D., Membrane Recycle System Usage for Helium Extraction from Natural Gas, Physics Procedia, 72(0): 93-97 (2015). Castro-Dominguez B., Leelachaikul P., Messaoud S.B., Takagaki A., Sugawara T., Kikuchi R., Oyama S.T., The Optimal Point within the Robeson Upper Boundary, Chemical Engineering Research and Design, 97(0): 109-119 (2015).